Fans can also pre-order I Am The Fire digitally at iTunes or in various physical formats at CM Distro. For a preview of I Am The Fire, the official video for the album’s first single, “My Will Be Done (feat. Mats Levén of CANDLEMASS, ex-YNGWIE MALMSTEEN/THERION)”, can be viewed here. An EPK for the album can also be viewed here. 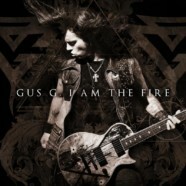 GUS G. handles all guitar, bass and keyboards on I Am The Fire, and is joined by a roster of friends and guests that helped bring his vision to fruition: drummers Jeff Friedl (A PERFECT CIRCLE, PUSCIFER, DEVO) and Daniel Erlandsson (ARCH ENEMY), bassists David Ellefson (MEGADETH), Billy Sheehan (MR. BIG, DAVID LEE ROTH) and Marty O’Brien (TOMMY LEE, WE ARE THE FALLEN), and vocalists Mats Leven (CANDLEMASS, ex-YNGWIE MALMSTEEN/THERION), Blake Allison (DEVOUR THE DAY), Michael Starr (STEEL PANTHER), Alexia Rodriguez (EYES SET TO KILL), Tom S. Englund (EVERGREY), Jacob Bunton (ADLER) and Jeff Scott Soto (TRANS-SIBERIAN ORCHESTRA, ex-JOURNEY). I Am The Fire was mixed by Jay Ruston (ANTHRAX, STONE SOUR, STEEL PANTHER) and was recorded between Los Angeles and GUS G.’s home country of Greece through the latter half of 2013. The album showcases a well-balanced mix of active rock, classic hard rock, traditional metal and guitar-driven instrumentals, taking listeners on a diverse journey through GUS G.’s soulful playing.